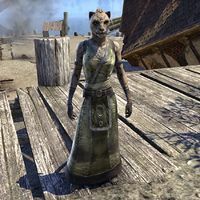 Abizah is a Khajiit commoner who can be found in Cat's Eye Quay. When spoken to, she'll say, "This one is glad the Dominion was here. Abizah could have died without your help." This page was last modified on 12 October 2017, at 08:33.